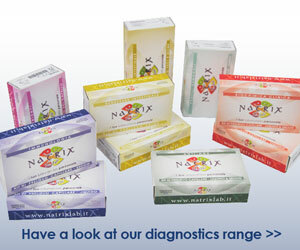 NatrixLab manifests its mission for quality and innovation in its products and services, but also in its processes addressed to providing you with the best possible service level. 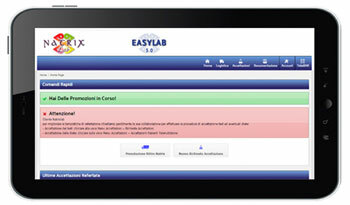 For NatrixLab ‘logistics’ means first and foremost client-supplier integration and efficient processes: through the free digital EasyLab platform you can directly book the sample collection with our logistics department, and track the process through to the final report. Complete test documentation: you will have access to the technical charts, analysis charts, sampling instructions and transport methods for all the diagnostic services your profile is activated for. Synchronised digital reports with the laboratory activities: the digital report is immediately available for you as soon as the laboratory process is complete. Information and details about promotions: you are informed in the login screen about a new promotion, so you can view the details and accept the offer. Advertising material: you can download the digital format of the advertising material about NatrixLab services, or you can order the posters, leaflets and display units for your centre. Through EasyLab you have a direct contact with NatrixLab: you collection booking is immediately viewed by our logistics department, enabling them to plan their routes considering your requests.No more time spent on the phone, a click is enough! Thanks to the guided completion procedure all the documentation reaches NatrixLab in a standard format, without anything missing, errors or unclear information which is often caused in haste. Handling a non-conformity extends the report time by 4-5 days. Before the printed report is delivered, you can keep your patient informed about the analysis progress and give them the results by consulting the online report. Do you need information to promote NatrixLab services, or do you want to start a campaign in your website or social profile pages? In EasyLab you have access to all the test information at any moment, and also the images to use for publishing your messages on the most popular social networks.